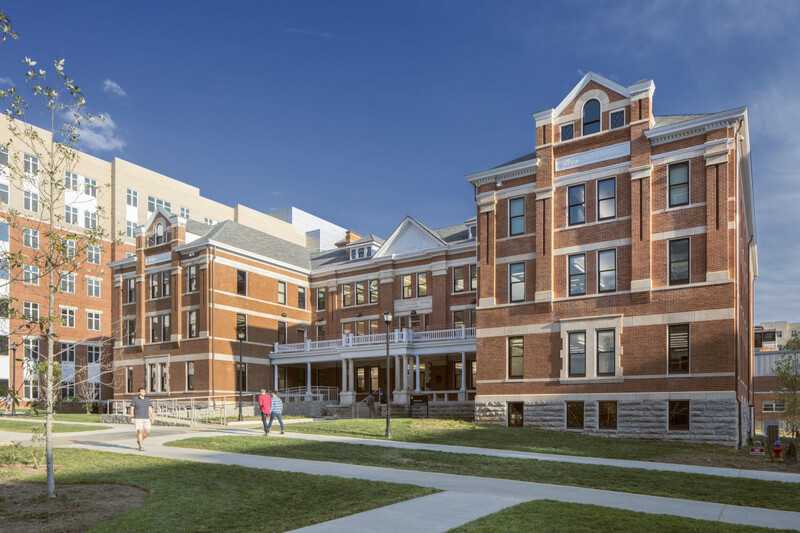 For a century and a decade, Patterson Hall served as a dormitory on the University of Kentucky campus. When the red brick and limestone Collegiate style Queen Anne opened its doors in Lexington in 1904, it made history: It was the university’s first housing for female students. At that time, the idea of women going to college was still novel, so, for decorum’s sake, the dorm was sited off campus in the southern city to segregate the sexes. As the public land-grant university grew to become the largest in the state, the campus not only expanded to include the three-floor gabled building but in the 1950s also was surrounded by new dormitories in what would become the North Campus. This is how things stood until 2014, when the university decided to replace the other aging dorms and move to an alternate management plan for its undergraduate housing. Patterson Hall, which had some 74 rooms that housed 120 to 130 students, was saved and the university chose to reuse it for another program rather than tear it down or continue to use it as a dormitory. As the demolition of the other dorms proceeded, the university commissioned the award-winning Atlanta-based firm of Lord Aeck Sargent to study the building and determine appropriate uses for the structure. The goal was to repurpose the hall for future students and secure its place in the institution’s history, which dates to 1865 when it opened as the Agricultural and Mechanical College of Kentucky. 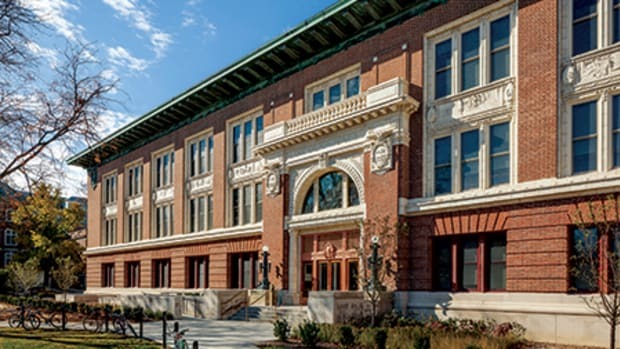 “The university didn’t want to change the character of the building and wanted to maintain existing volumes and spaces,” says Lord Aeck Sargent Principal Karen Gravel, AIA, LEED AP, who is the director of the firm’s historic preservation practice area. “The university also thought it would be a good fit for a living/learning center. We liked to think of the structure as the ‘living room’ for the North Campus. We helped them see how the spaces could work and determine the best way to integrate new programs. Many of the spaces, such as this faculty office, include original doors and other vintage features. The wood-framed windows are historically accurate replacements. 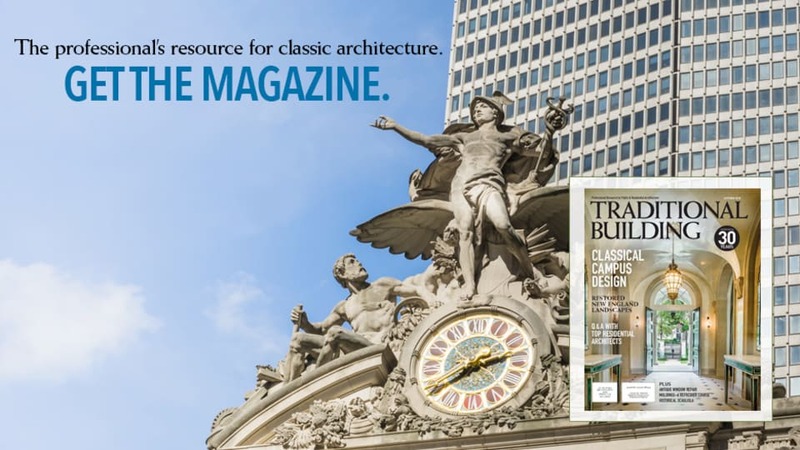 Lord Aeck Sargent, a recipient of the American Institute of Architects’ National Honor Award, specializes in a variety of practice areas, including science and technology, urban design, housing and mixed use, arts and culture, higher education and historic preservation. It has won awards for a number of college and university preservation projects, including the Andrew Carnegie Building and the Hinman Building for the College of Architecture at the Georgia Institute of Technology; Ennis Hall at Georgia College and State University; Building D at Kennesaw State University; Language Hall at Oxford College of Emory University; Sanford Hall at Georgia State University; and Campbell Hall at Agnes Scott College. 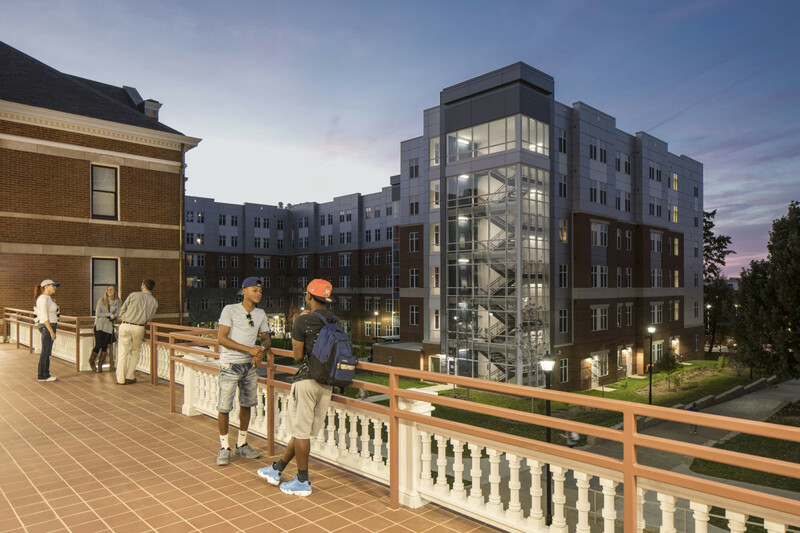 The Patterson Hall project, which drew upon the expertise of architects in the Atlanta and Lexington offices, had special meaning for Gravel, who grew up in Cynthiana, KY, and was familiar with the campus from visiting friends who attended the university. 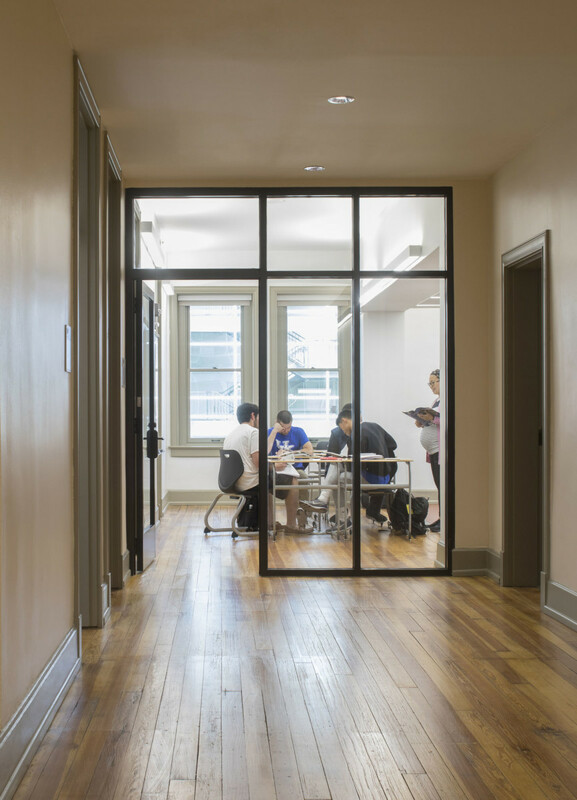 A glass panel, in a traditional storefront style, gives a classroom a contemporary feel. The $15-million project, which took nearly two years to complete, also included restoration work to the exterior of the hall. 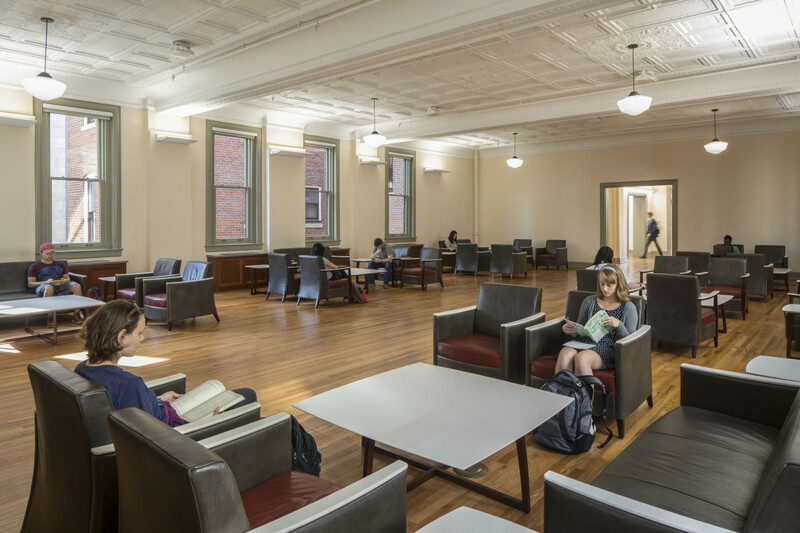 The Lord Aeck Sargent team, which worked on other significant projects for the university, including Maxwell Place, the president’s house, restored the main hall’s pressed tin ceiling and replaced the non-historic aluminum windows with new wood windows. The team researched and painted the exterior of the windows in a polychromatic color scheme appropriate to the period. 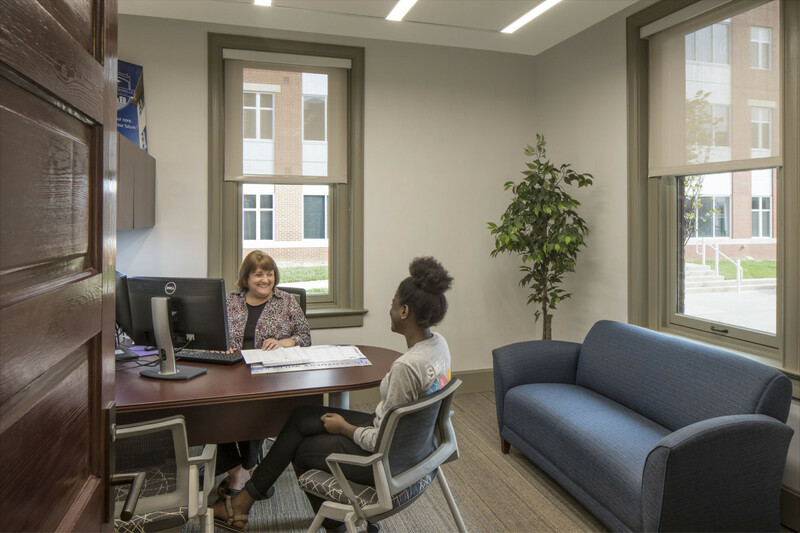 Inside, the team replaced mechanical, electrical and plumbing systems and created seven 25-person classrooms, two 45-person classrooms, study lounges, faculty offices, several smaller seminar/ conference rooms, a pantry where snacks are sold and three apartments for visiting professors. The assembly hall, the site of a former café, features a pressed-tin ceiling, wooden floor and virtually invisible contemporary uplighting. Priority was placed on making the public rooms as historically authentic as possible. 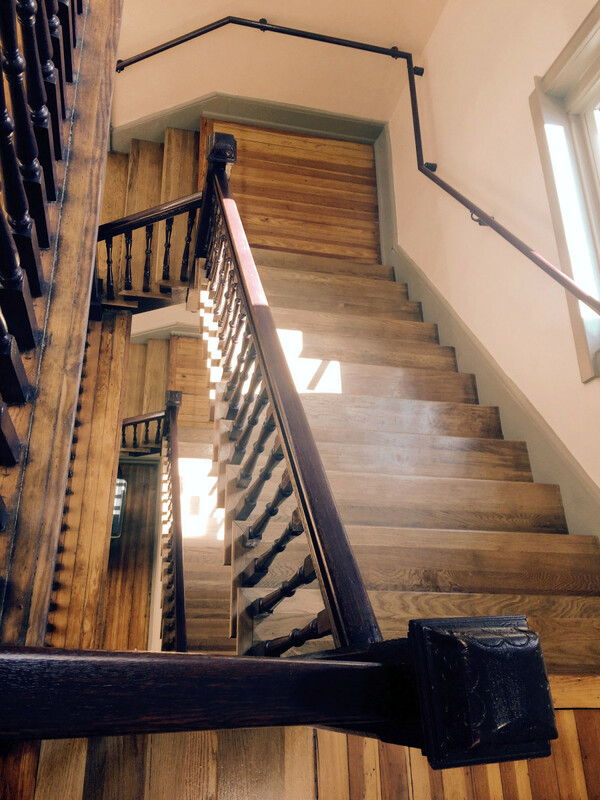 To save money, the worn wooden floors of smaller spaces such as faculty offices were carpeted or covered with linoleum instead of being refinished. 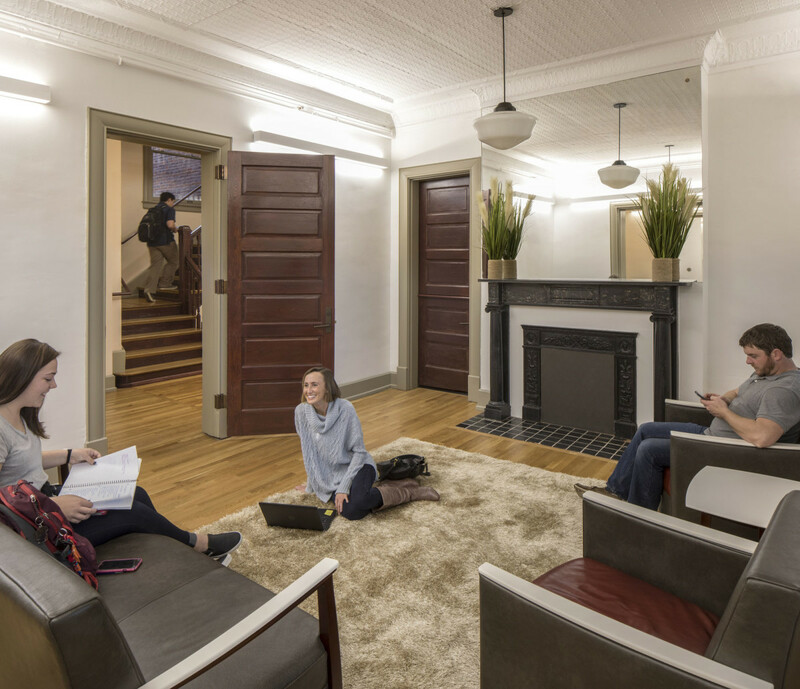 One of the dorm’s former “living rooms,” complete with original fireplace, becomes a center for 21st-century study and socialization. The main assembly hall, which had at one point been the dorm’s dining area, is a prime example of the seamless melding of past and present. 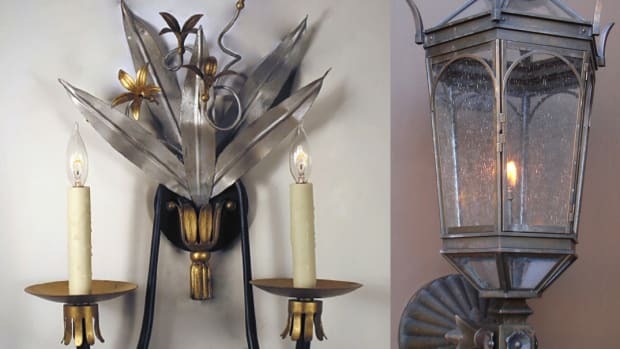 The wood floor and pressed-tin ceiling are original; the replacement windows are historically accurate, and the light level of the period-style lighting —schoolhouse pendants—is supplemented with virtually invisible uplighted wall sconces that look like molding and draw the eye upward. Radiator covers now cleverly conceal boxes for the variable air-volume heating system. Throughout the hall, a crisp color scheme— white and a peachy-cream with grey window trim—is rooted in the history of the building, yet reads as contemporary clean. 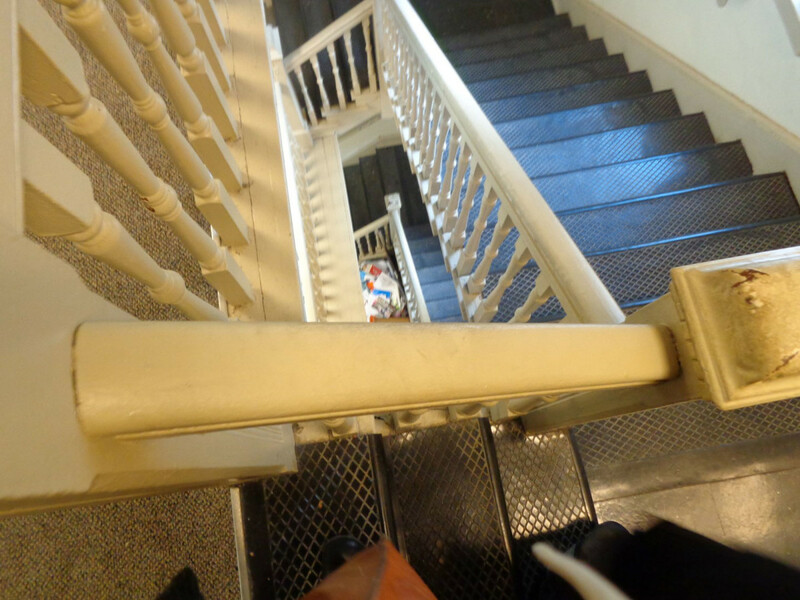 Perhaps the most dramatic difference between Patterson Hall then and now is the opening up of a pair of central staircases that mirror one another. “They had been enclosed because of fire regulations,” Gravel says, adding that going up and down the hallways between them was like walking through a dark tunnel. “We worked very hard to open the staircases, ultimately by adding two stair towers on the exterior at the rear of the building.” The extra effort was worth it, she says, because the space is now bright, open and airy—characteristics much sought in the 21st century. Aside from the staircases, the bathroom floors proved to be the most challenging aspect of the hall’s repurposing. 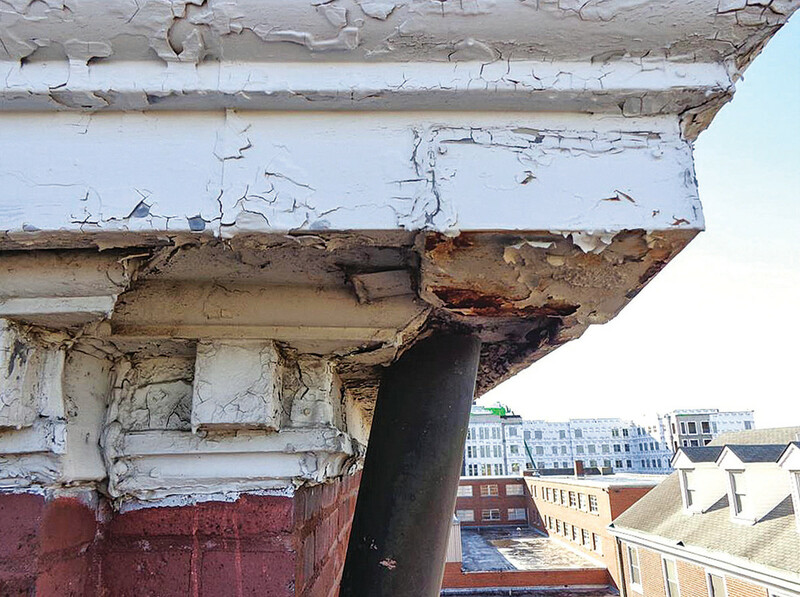 “We kept the bathrooms in the same spaces, but we removed the communal showers because they were no longer needed and difficult to work around,” she says.“ The floors were concrete, and when we opened them up, they were in terrible shape. It was a significant effort to replace them." The furnishings, selected by the university, are traditional and technological. The main assembly hall, for instance, is appointed with sleek leather chairs that are ideal for doing homework on laptops and tablets. 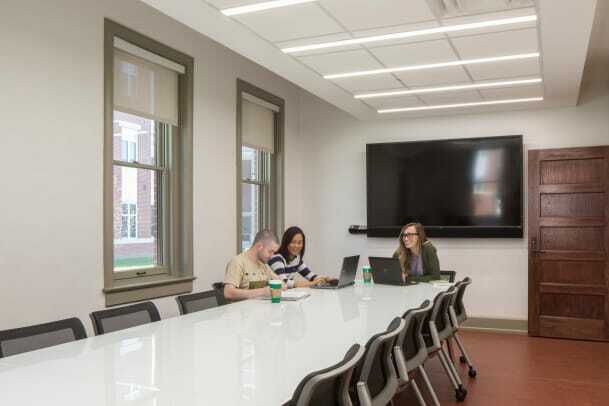 The smaller classrooms feature glass dry-erase conference tables with individual outlets for each student that are designed for doodling or proving the latest theory or theorem. 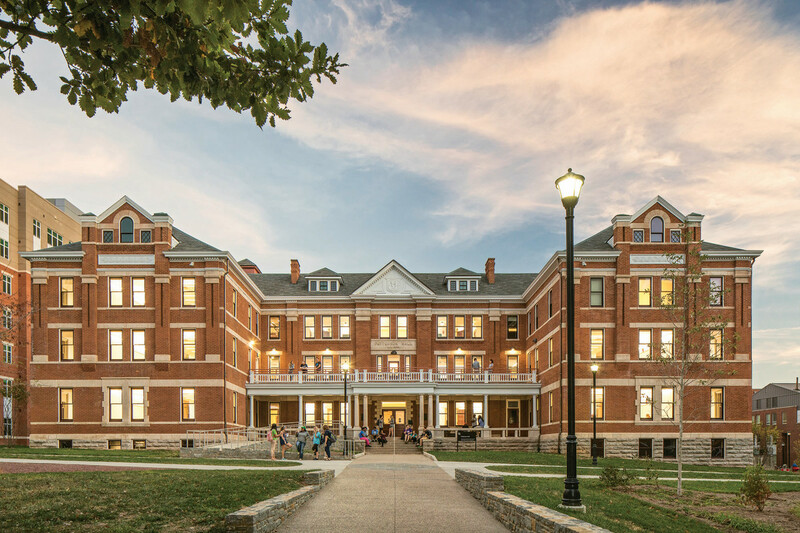 To visually link Patterson Hall to its newer siblings, which also are red brick and limestone, the Lord Aeck Sargent team designed the landscape of the courtyard to tie the buildings together and create a cohesive exterior space. A wide pedestrian pathway, flanked by limestone seat walls, connects Patterson’s front door to Limestone Street. People are encouraged to stop and enjoy the exterior space: A crushed-brick pathway features seating beneath large shade trees, and large-caliper oaks along its way mimic the stone pathway that led to the hall in its early days. Lord Aeck Sargent “unboxed” a pair of spiral staircases that mirror each other, preserving the original wooden bannisters. The alumni she’s bumped into also are enthusiastic about the new use. “I’ve had several people tell me how happy they are that we were able to repurpose the building,” she says. 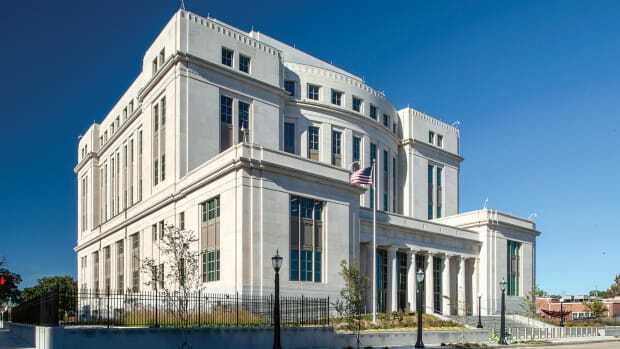 Hartman-Cox Architects designs the new John A. Campbell Courthouse, which has reigned as the highest seat of justice in Mobile, Alabama, since 1934. 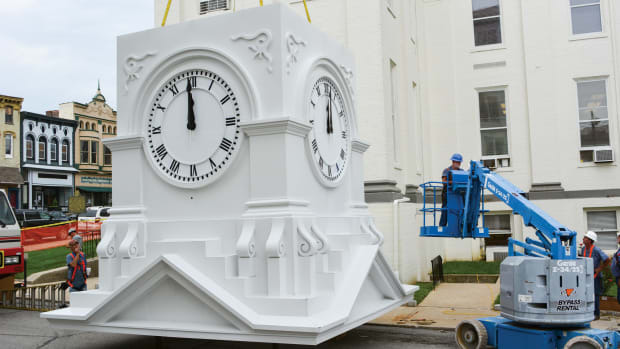 An 1853 clock tower for a Kentucky courthouse is replicated by Campbellsville Industries.